Oscar Shumsky was a musician’s violinist as much as he was a violinist’s violinist. Although his career never achieved the star status enjoyed by some of the more aggressively marketed artists of his generation, Shumsky was revered by professional musicians as well as by the concert public that did have the chance to hear him. Oscar Shumsky was likewise revered by his students, and by anyone who had the chance to hear him in a casual setting. Vestige Classics, the label organized by Shumsky’s son Eric, himself a well-regarded violist, last year released a CD which bears testament to the elder Shumsky’s gifts. Oscar Shumsky: A Life Portrait is a compendium of live recordings never before released, chronologically covering most of the violinist’s career. The CD opens with eloquent introductory notes narrated by Eric Shumsky. The first selection is an astonishing reading of the first movement of the Beethoven Concerto with the Curtis Orchestra and Fritz Reiner recorded in 1938. This example of Oscar Shumsky playing the deepest of masterworks at 21 years old is astonishing in it’s vibrancy, excitement, beauty, and violinistic brilliance. The playing is so thrillingly in command, so tremendously deep interpretively, and so full of successfully navigated performance risk, that the listener can be completely transported by the performance, despite substantial flaws in the fidelity. The Viotti Concerto No. 22, recorded in 1948 with pianist William Sokolov is textbook brilliant violin playing and an example of Shumsky’s uncanny ability to take a rather stock, if beautifully crafted piece of the repertoire, and turn it into a spellbinding performance. An excerpt from Swan Lake, the famous Act 2 Pas d’action recorded around 1955 is absolutely heart wrenching. The Bach Chaconne recorded in 1967 is also wonderful, both violinistically and stylistically. Shumsky’s playing in Bach is robust, romantic and tasteful at all times even if puritans among us would classify the approach as uninformed as to period style. But violin mavens usually steer clear of this debate. Shumsky’s Bach represents an equally satisfying alternative to the urbane romanticism of the Milstein approach, which many consider the standard in Bach played on modern violin. The CD is rounded out with two more excellent recordings: Mozart B Flat Duo recorded in 1983 with Eric Shumsky, and the Dhonanyi Ruralia Hungarica Opus 32 C, recorded in 1993 with Seymour Lipkin on piano. Oscar Shumsky: A Life Portrait is notable for both it’s high points and for the overall consistent quality of the playing and music-making. The one criticism which one could make (and for which the liner notes apologize) is the low fidelity of many of the recordings. There is surface noise present in many recordings, especially the Beethoven Concerto, and the Tchaikovsky is not quite at pitch, making it difficult for those with perfect pitch to listen with comfort. But these are small criticisms in the context of a CD which violin fans are lucky to have. The overall impression that emerges after listening to this CD is that of an artist possessed of unflagging violinistic and musical integrity, as well as inspiration. This is truly great artist who never sold out to the violin or the music business. 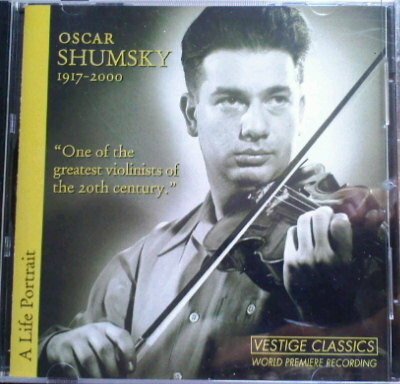 In short, Oscar Shumsky was a model violinist and musician. Through these and other recordings future generations of players will have the opportunity to emulate Oscar Shumsky’s mastery and integrity. Thank you Eric Shumsky for giving the world the opportunity to hear more of this amazing artistry!